I created this formula because I wanted a cream that would perform like a gel.This works EXCELLENTLY with our NEW Curl Styling Leave In Cream. 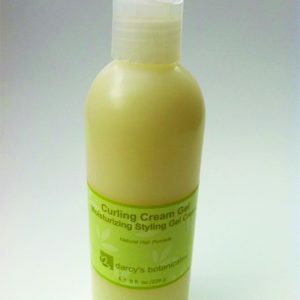 Use for setting curls, styling 2-strand twists, braids and defining your natural curl pattern. Thanks to everyone for the wonderful tester feedback on our New Curling Cream Gel. damp hair from root to ends. Works best using our Curl Styling Leave In Cream. Distilled (Aqua) Water, Cetearyl Alcohol, Cetearyl Glucoside, Hydroxypropyl Methylcellulose, Cetyl Alcohol, Organic Wildflower Honey, Camellia Oleifera Seed Oil, Hydroxypropyltrimonium Chloride (cationic guar gum), Phenoxyethanol, Caprylyl Glycol, Fragrance, Astrocaryum Mauritia Flexuosa Fruit (Buriti) Oil and Silk Amino Acids. *Use to help set your curls, twists and braids in place. *Use as a twisting cream for 2-strand twists. *Use to moisturize and define your natural curl pattern. © 2019 darcysbotanicals.com. All rights reserved.